1978: Jonestown, Guyana. 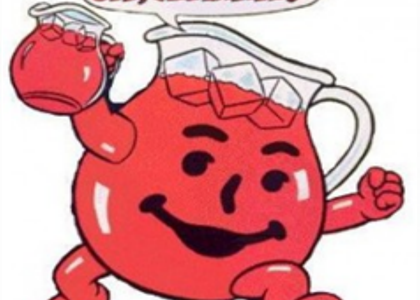 Over 900 people died, including 87 young children, when they drank Kool-aid laced with cyanide and other drugs upon the advice of Jim Jones, their religious-cult leader. Wikipedia defines the expression “drink the Kool-aid” as meaning accepting belief in a dangerous idea because of perceived high rewards. Such as 900 people killing themselves in a belief this existence is of little value and they will be amply rewarded in an afterlife. Such as suicide bombers who believe though they will die, it is for a cause bigger than their on-earth existence. And, I would argue, very like fossil fuel lobbyists, business moguls, and government leaders who have drunk the Kool-aid regarding the lucrative (so close the typing ludicrous there) present and figure of fossil fuels even though the actual danger is proven and will affect every person, every species, on the planet, now and forever. So I get a bit frustrated when I speak about integrative design or green building or renewable energy, and someone says “oh, I see you’ve drunk the Kool-aid.” No, quite frankly, I’ve switched to tap water, micro brew beer, and my morning coffee, and I see clearly, now. Not a drop of cyanide in sight. It is an intriguing and deep world of individualism. I see the work we have to do and the opportunities in that work. I see the danger of ignorance and of ignoring. I see the power we have as individuals. I am learning about the wisdom of crowds and building on the vast, intricate energies and experiences of engaged people. I see the magnitude of the inescapable dangers inherent in “drinking the Kool-aid” of the fossil fuel industry, and wonder how we can let false prophets continue to mislead us specifically for their own personal financial and power gains. I see the joy and success at levels including and beyond the mere financial gains in doing well by doing good (Ray Anderson, Interface, 1998) and have come to meet so many amazing people who are informing my ideas, furthering shared discoveries, and changing the world. Many might say that these people are like-minded and have “drunk the Kool-aid”. The fact is quite the opposite. They have accepted thinking their own thoughts, exploring their own capabilities, and are recognizing how past experiences can inform their new endeavors. They each have skills aligned but vastly different from each other’s. It is an intriguing and deep world of individualism. They do share several traits: curiosity, respect for each other and the planet’s systems, a desire to continually improve, flexibility in learning, a lack of fear of failure, and, often, a joy in collaboration. So, ditch the Kool-aid given to you by the fossil fuel industry’s lobbyists and it’s bought government leaders, the drink that you currently hold in your hand, and see clearly the work we have to do to create out future well, by doing good.